Working outdoors? You need work hoodies! Many businesses have employees that need to work outdoors. For much of the country, that means part of the time they have to work in the cold. Enter work hoodies. No matter the temperature, work hoodies that have your branding, especially large on the back, are a great way to keep your employees comfortable and increase brand awareness at the same time. There are various weight hoodies employees can wear outside, including the extra-heavy cross-grain 12 oz hoodies for maximum warmth. 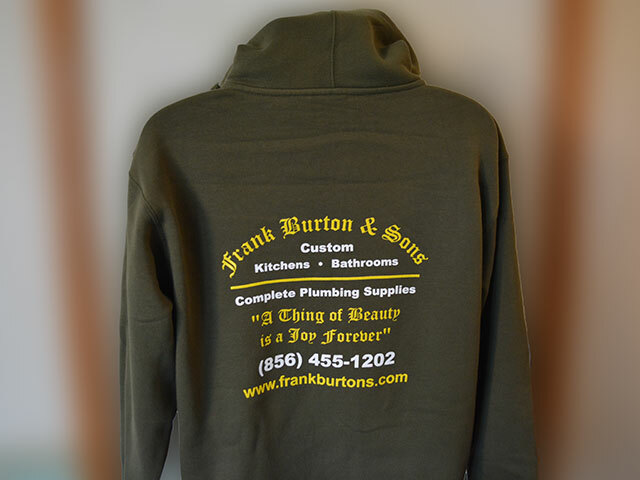 One example is Frank Burton & Sons who wanted their employees to be both branded and warm while they were installing beautiful custom kitchens and bathrooms in the homes of their clients. Since they didn’t need the heaviest weight fleece, they chose a Comfort Colors zip hoodie for their employees. Comfort Colors offers lots of color options, making it easier to match the branding of a company’s colors. Click HERE for a small sampling of their fleece. Every business and organization today benefits from branded wearables like work hoodies or polos or even more stylish apparel like oxfords, button-down shirts, and blouses for ladies. Branded shirts, jackets, and caps are a great way to build brand awareness as well as identify your employees to prospects and customers. Look no further! D and S Designs has been decorating wearables since 1991. We know what to buy and where to buy it. We know how to make your team, business, or organization look its best. Contact our top buyer, Sandee, to get her expert buying help for the wearables YOU need! Contact us HERE.